Navigating our careers as a journey of soul ultimately asks that we come to engage the world with a kind of ‘double vision’. We can view our work not only from the perspective of consensual, material reality, but become mindful too of another ever-present mythic, imaginal or psychic reality which runs alongside this. It is in living on the edge between these two worlds that the experience of a meaningful life and of one’s work as a soul calling arises. When C.G. Jung (1933) wrote that, “'the psychic depths are nature, and nature is creative life” he was saying that psyche is, at root, nature. Jung’s words remind us that nature is the larger framework of the psyche. In this course you will engage with selected readings and insights from Jungian and archetypal psychology, and the field of ecopsychology (which explores the relationship between ecological and psychological experiences) towards embodying a profound sense of soul-purpose in your life and work. 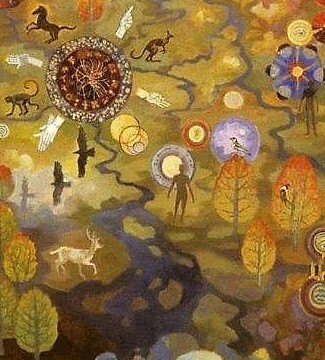 We will explore how deepening our engagement with the natural world — whether in the company of trees, animals or birds, attending to the ancient elements of nature, or in the desire for pilgrimage — offers an ever-present connection with the archetypal realm and an awakening of the soul’s calling. Participants will be introduced to the Jungian technique of Active Imagination, a method of dialogue between the conscious and unconscious mind, for gaining personal insight and guidance around the archetypal patterns and vicissitudes of their lives at work. Drawing upon an informed understanding of C.G. Jung’s theory of synchronicity (which he developed in collaboration with Nobel-prize winning physicist Wolfgang Pauli) and the psychoid nature of the archetype, we will consider the synchronistic nature of vocation, lived as a dialogue with an animated world. A profound experience of synchronicity can awaken us to the humbling yet re-enchanting sense that our life and vocation is part of some larger, radically interconnected yet mysterious whole or field. This has parallels in Buddhism’s metaphor of Indra’s Net, what medieval alchemy called the unus mundus and physicist David Bohm termed the ‘implicate order’. Archetypal astrology and the Tarot will be examined as two examples of synchronistic phenomena which can be engaged for vocational insight. You’ll receive guidance in exploring these practices and the opportunity to share your experiences, questions and insights. We will consider how the ability to ‘think synchronistically’ can help us to discern and act on career opportunities for meaningful work. Lastly, crafting a life with allegiance to these ‘two worlds’ — of both literal, material reality, and an imaginal, mythic or psychic reality — is an immensely rewarding but perennially challenging task! We will consider the benefits, pitfalls and the necessity for cultivating discernment along this path. Online learning takes place through a stimulating mix of lectures, readings, theoretical perspectives, lived experience and real-life stories, examples from films, experiential activities, reflection, discussions and personal feedback from the instructor, Dr Suzanne Cremen. A reading list of books and articles will be provided on registration. The online format is so convenient as you can work each week at a time and place to suit you. Students are frequently surprised by how conducive the online space can be for personal reflection, connection with others and soulwork. Each online course has a limited of participants to ensure personal attention from the instructor, Dr Suzanne Cremen. The required reading and level at which our courses are taught is designed for adults with a tertiary education (any discipline). This course is designed for women and men who have already completed a minimum of two other courses in the Life Artistry Centre series. It will appeal to those who are seeking methods and insights for collaborating more imaginatively and creatively with the psyche towards the re-enchantment of their own work and careers in this emerging age of the Anthropocene, as well as to those in the helping professions who desire to facilitate an enlivened sensibility of the psyche or soul with their clients. To ensure personal attention, class size is limited to 8–10. The online course is currently limited to residents of Australia and New Zealand. Interested people who live outside Australia and New Zealand are invited to contact us for course information. No refund applicable from week 3.